Please note: Before using this data in your family tree, you should check against the originals, held at the Bedfordshire and Luton Archives and Records Service, Bedford. Some of the writing is very difficult to make out, and these transcriptions are provided for basic information only. Always check the originals! If you are interested in the history of the Church itself, I recommend the book “St. Michaels Woburn Sands,the Church,the Parish and the People“, by Evelyn Wright. ISBN: 0952259303. “In October 1865 the Select Vestry of St. Botolph’s, Aspley Guise put forward a plan to form a new District out of the parishes of Aspley Guise and Wavendon and build a church at Woburn Sands, which had previously been a hamlet attached to the parish of Wavendon. The plan went ahead with full approval from both parishes. Two of the most influential supporters were William Denison, a churchwarden at Wavendon, and John Vaux Moore, Rector of Aspley Guise, who left £5,000 in his will for the maintenance of a Minister – for the yearly sum of £166 13s. 4d. The Duke of Bedford would provide the land and finance the building. Designs were drawn up by the architect Henry Clutton of London, and the building was started in 1867. The Consecration Service took place on Tuesday, 22nd September 1868. The budget for building the church was very tight – just £5,000. There were no choir stalls, lectern, or organ, and the pulpit was “of no great distinction”. But Mr Stevens of Aspley Guise donated an organ which had been in his family for 300 years. This organ was replaced in 1880 with the instrument we have today, but we are told the sale of the old organ went some way towards the cost of the new one – 300 guineas. The church clock was donated by a sister of John Vaux Moore and cost £100. The first vicar was the Rev’d Hay Erskine, previously rector of Aspley Guise, and the churchwardens were William Denison, who lived at Fenton House, which later became the vicarage, and William Clarke, a corn and coal merchant. The first Verger was Henry Bazley, to be followed in 1893 by Henry Hebbes – the grandfather of Muriel Hebbes who is still living in Woburn Sands when these notes were compiled in February 2006, aged 101. The Rev’d Hay Erskine left in 1874 and there have since been ten more vicars – including the present incumbent Rev’d Norman Jeffery, who came to Woburn Sands in 1986. 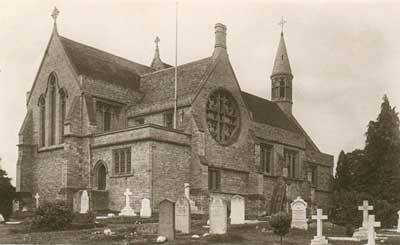 In 1889 the church was enlarged, providing 100 extra seats. A new pulpit was given by the Stuart family of Sandymount in Station Road in memory of four of their children. They also donated the stained glass window in the Lady Chapel. The original East Window (which can now be seen in the “upper room”) was replaced by the Window of the Ascension, given in memory of the churchwarden William Denison who died just before the extension was completed in 1890. In 1968 – to celebrate the church’s centenary – two new windows were formed in the south wall of the chancel, and the external brickwork completed with stone cladding. In 1970 a new vicarage was built in Church Road. The old vicarage was sold, and retirement flats (Shelton Court) were built in the garden. The building was named in memory of Rev’d John Shelton, Vicar of St Michael’s for 33 years – from 1913 to 1946.